An expert closet designer tells all. Ask anyone who’s ever gone house hunting, and they’ll likely tell you there’s no such thing as the perfect master closet. Home to some of our most treasured possessions and (many) stylish finds, there’s a reason that having a large enough closet (let alone having a closet at all) is often a make or break must-have for potential buyers. That’s why when Domino teamed up with NYC-based interior designer Bennett Leifer to redesign a model unit at the historic One Hundred Barclay in downtown Manhattan, we tasked California Closets design consultant Carolyn Musher with creating a closet “wow” moment upon entry to the master suite. Now the ultimate dressing room, you’d almost never know that the spacious master closet was once your standard storage space. Today, the master closet at Loft 13B comes complete with a dreamy built-in vanity, plenty of hanging space, and shelves to spare. 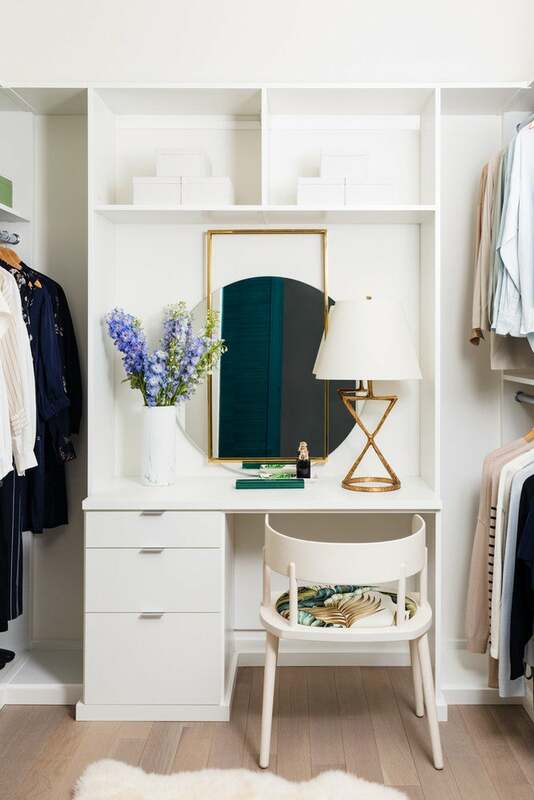 Here’s what the closet pro had to say about transforming the most basic of storage nooks into a wow-worthy dressing room. Tip 1: Make room to get ready. In an effort to add extra square footage to the master suite, Musher set out on reimagining a space that would act as a seamless extension of the bedroom. By installing a vanity, she was able to designate a proper spot for the apartment’s to-be-owners to prep and contemplate their OOTD. “The vanity makes it more inviting and makes it seem more like an extra room, rather than just a closet,” says Musher. The bonus addition instantly elevates the typical walk-in to dressing room status. Tip 2: Assess what you have. Have a shoe problem? Can’t quit your vintage addiction? We’re not here to tell you that you should change your dressing (or hoarding) habits. But we are here to remind you that understanding how you dress and what you own is the key to designing a closet that’s the perfect fit for you. “Everyone lives differently and buys differently. You might have someone who has 75 black shirts and somebody who has 100 pairs of sneakers. It all depends on what they have,” explains Musher. With an imaginary client in mind, Musher wanted to incorporate a little bit of everything into the Loft 13B master closet—like a spot for long-hanging items (dresses, coats, etc. ), short-hanging items, shoes, and seasonal wares. The real secret to this ultra-sleek space? Overhanging. “Whenever you’re getting into one of those cookie-cutter closets that [only have] a shelf and a pole, you can’t hang on top of one,” notes the designer. By taking full, floor-to-ceiling advantage of the closet, Musher was able to almost triple (!!) the hanging space. Tip 3: Edit your wardrobe—regularly. Fact: A clutter-free closet is a happy closet. Musher’s number one rule for keeping a perfectly clean dressing space? Start by scrapping anything you know you haven’t worn in a year or simply doesn’t fit. Tip 4: Buy a garment rod. Regardless of whether you have a walk-in or not, according to Musher, there’s one thing no official or makeshift dressing space should ever be without: a garment rod. Also called a valet rod, this extendable tool—which can easily be installed along the interior of a shelf—lets you face your clothes toward you. So if you’re the type of dresser that likes to lay out your outfit the night before or are constantly losing track of spare hangers, this simple add-on is a total life-saver. Big thanks to our friends at Vince for filling the dressing room with great clothes!